Somewhat Quirky: Do You Forget To Put Away the Towels? Do You Forget To Put Away the Towels? I just wanted to drop a quick post to discuss an issue that has plagued me my entire life. Is it that I don't like laundry? I like clean clothes so, eh. Is it that I don't like folding laundry? I don't particularly mind it. Is it that I don't like putting away folded laundry? My problem is that I forget to notice. I forget to notice that it needs to be done. This problem is not isolated to laundry. It happens all over my house. I can see the tiniest little weed in my garden. 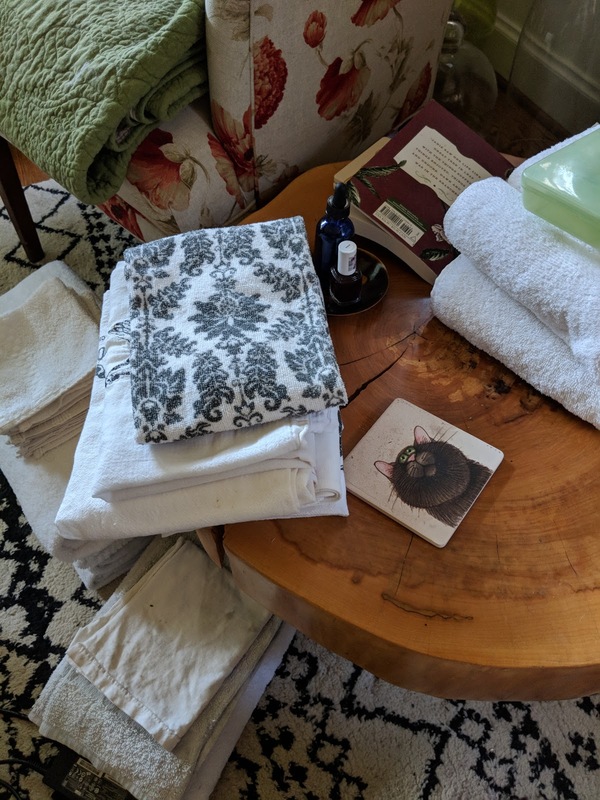 It took me two days to notice that I forgot to put these towels away. So here I am to say, "welcome to my world!" I'm not even going to spell check this. P.S. I finally got all the towels put away at 10 p.m. Shaking my head. I have my deepest thoughts over simmering pots, weeding the yard and folding laundry. Three things that take more time then I have right now. Made me laugh big time - I am a resident of your world (sigh)..... LOLOL!! This is so me!! Thank you for sharing! !